I believe Sticks’n’sushi is an unfortunate name. No? Just me? Sticks and sushi. Sticks, sushi. You kind of expect it to be the sort of sushi restaurant you find in a shopping centre or by a petrol station. You know, the sort you wouldn’t actually eat in. Most sushi restaurants in London will use a sophisticated Japanese word. Sticks’n’sushi doesn’t need that. It’s so good that it can afford its refreshingly honest name: they specialise in yakitori (sticks) and sushi and that’s all its name will give away. For everything else, you’ll have to cross its unassuming door. The restaurant is incredibly sleek, all black, with dainty little china plates and smooth round stones to hold your chopstick (which, however, are of the wooden sort you get with a takeaway). It’s the sort of place where a charming waiter will pour soy sauce from a miniature jug made of stone onto the smallest and cutest dipping plate and will keep topping up your water all night. The tables are lined with leather which I suppose is meant to be really cool but it reminds me of thecar seats and makes me a tiny bit motion sick (sorry). The place is buzzing with couples and big groups sharing the biggest platters of sushi you will ever see. It’s intimate enough for a catch up and perfect for bigger celebrations. They also have a bar downstairs that serves food and good vibes. The menu is spectacular, every picture styled and shot to perfection, very Scandinavian in its minimalist simplicity, as glossy as a food magazine, with cryptic captions between pages, it’ll have you salivating before you manage to order a drink. The cocktail list looks very polished and pretty, with sake-based citrusy martinis and well-balance sweet cocktail. The first cocktail I went for, the Hanoko, sounded heavenly with tea and floral notes but ended up just tasting like honey. My second cocktail was lovely, a pear-based seasonal one that retained the sweetness and complexity of pear, and its grainy texture, with a subtle kick. 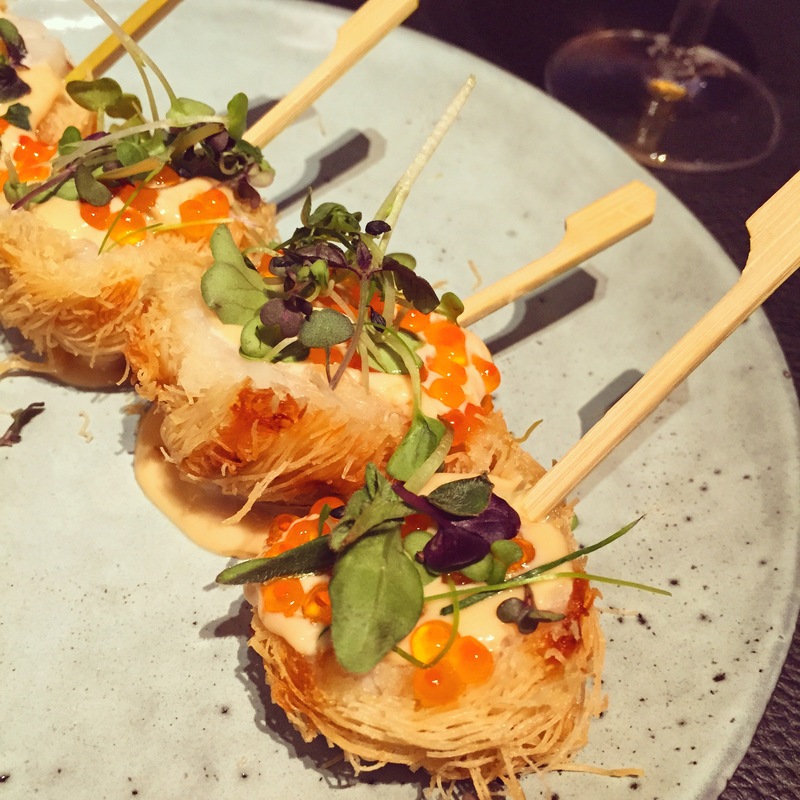 We decided to share a maki based menu -maki deluxe- and the Hotate Kataifi bites – scallops in kataifi with miso aïoli, trout roe & cress. Now, the scallops. The scallops. They were perfect bits of savouriness and umami. A perfect marriage between the soft, melt-in-your-mouth texture of the scallops and the crunchy kataifi, very thin middle Eastern noodles – think baklava, but savoury. These bites were one of the best things I had ever eaten and I feel like food will be a disappointment from now on. Forever. Until I go back and get some more. 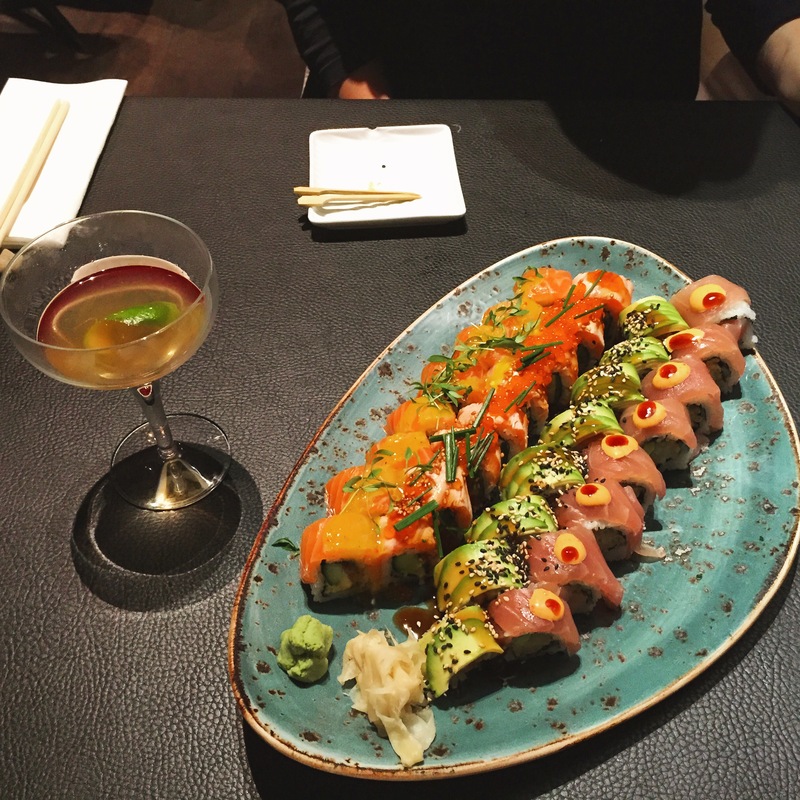 The maki came of the prettiest plate, a very generous portion, and a very eclectic and decadent mix of flavours and textures that were incredibly satisfying. 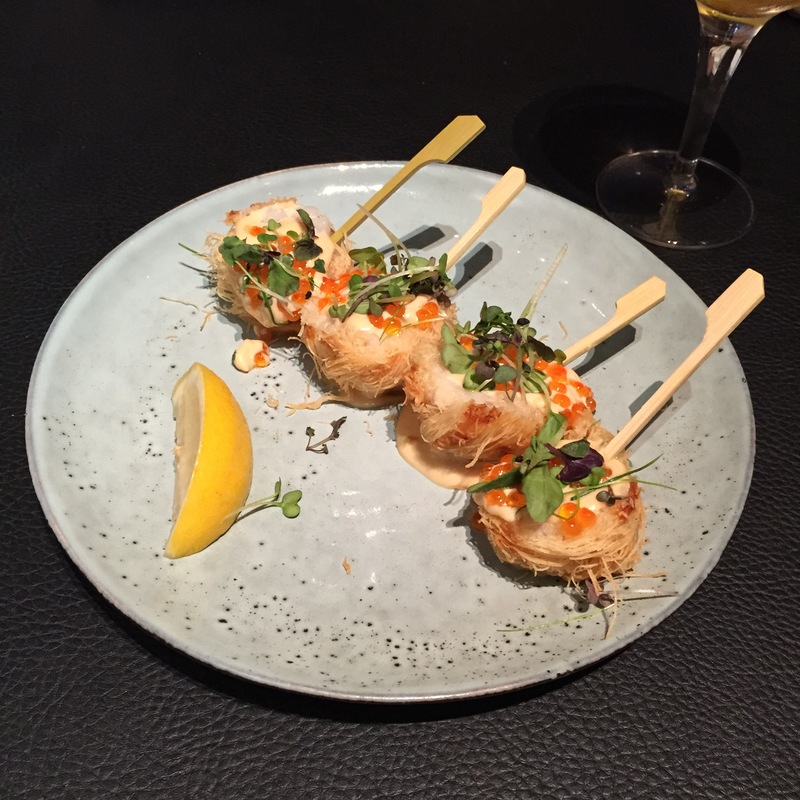 The Hell’s Kitchen were pockets of crispy tempura prawn topped with the softest tuna and a smoky, spicy barbecue sauce. The shake aioli came with an enticing miso-aïoli and were topped with seared salmon and intensely salty trout roe. I especially loved the salmon ceviche roll, with its fresh, aromatic hints of coriander and lime which worked perfectly with buttery salmon. The menu of this Danish-born sushi place draws inspiration from cuisines all over the world and the result is a decadent mixture of intensely umami sauces, buttery fresh fish and simple sushi rice. 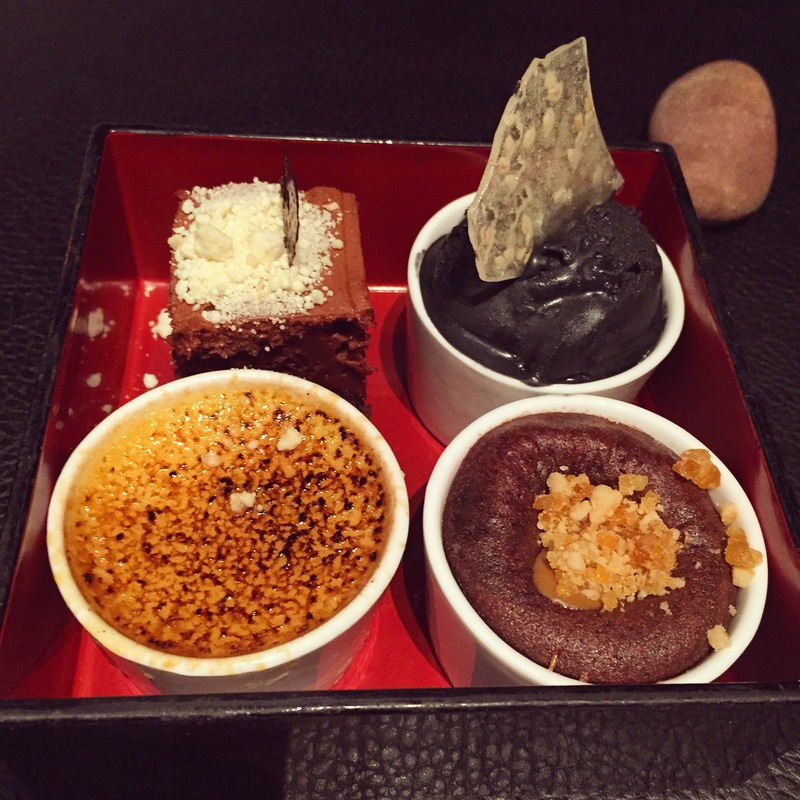 I don’t normally go for dessert, as I have a habit of over-ordering and being full to the brim well before the end of a meal, but I was intrigued by the miniature desserts, and chose a set of four which are perfect if you have a sweet tooth. There was the most beautiful, charcoal-coloured black sesame ice cream, all shiny and glossy and nutty. And the bergamot crème Brule, the perfect crunchy crust to break into, gooey citrusy and floral custard to be spooned up, the sound of spoons clinking against a ramekin. The rest, well, was chocolate.